The Fathom Five National Park makes scuba diving Tobermory extremely desirable. The crystal clear waters, countless ship wreaks and underwater limestone caves make this a top scuba Canada site. The only drawback are the icy cold waters which are even cold in the middle of August. This means full wet suits even in the summer to explore Tobermory's underwater beauty. 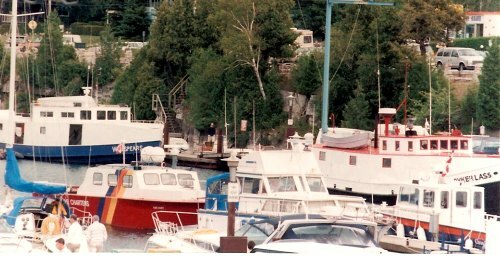 When you walk around Little Tub harbour you will notice old fishing boats that have been converted into dive boats. You might even spot some divers in the harbour. There are a number of dive shops that you can hire to take you out to see the wreaks or get your certification. The most prominent is Divers Den. In fact Tobermory's medical clinic is one of the few places in Canada to have a Hyperbaric dive chamber, making it one of the safer scuba Canada areas to dive. Even through the 20 historical shipwrecks are a big draw for diving enthusiasts to Tobermory it isn't the only reason this site is popular. Tobermory also has geological pull as well. The archipelago of 19 islands formed out of limestone rock allows you to peak back in time. You can see submerged forests, canyons and underwater waterfalls. Check out the remains of ancient coral or watch the current wildlife swim by. Even if you aren't into scuba diving you can still experience the underwater beauty of Tobermory. Snorkeling, snuba and glass bottom boat rides are all available out of Little Tub Harbour. Return HOME from Scuba Diving Tobermory.